P and I over breakfast had a discussion about a right kind of pride and a wrong kind of pride. Quite hard too to communicate these ideas effectively to another person and to understand what they are really saying. We got away after a pretty good sleep in the inner tent on the platform in the hut, in really good time. We planned quite a big 11km section to get us to One Tree Bridge for morning tea as the book said there was a cafe there. Set off at a very good clip and really kept up a good pace, both feeling quite good, particularly as it wasn't raining. It did rain overnight and I was very glad to not have a wet tent or rain for for the morning. At first listening when I woke up I thought it was raining but it turned out to be the noise of the river and only dripping from trees on the roof. We got straight into walking clothes once up, which speeded our morning packing up considerably. It's funny what you suppose from the words in the book. At 1.5 it says "Pass Roy Road on your right", which we did, but Roy Road was nothing like what the word 'Road' might have led us to believe! Much of the walking today is on old roads, old railway lines and across current roads, which is all evidence of the activity in the recent past. 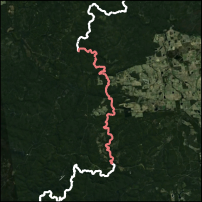 The Munda Biddi Trail is a recent addition, and I think probably necessitated the upgrading of bridges and track when shared with the Bibbulmun. 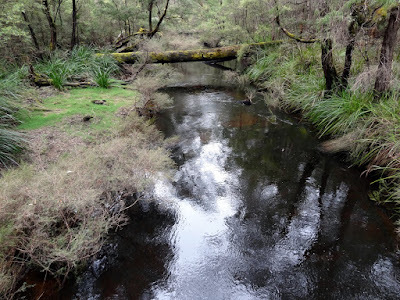 The last section into One Tree Bridge and morning tea is pretty level and our desire and expectation urged us along past picturesque private properties and over small creeks and beside the Donnelly River to the crossing. Saw a white throated yellow bodied black capped small bird singing beautifully and a red rumped spotted finch and the usual playful fantails. Plus some red headed parrots. Usual gorgeous bird song. Well, I had all kinds of worse-case scenarios in my mind concerning the cafe, but the worst one of all materialised in that it wasn't even there any more, just some accommodation chalets. Scones and iced coffees floated off into the ether and good old faithful scroggin was still there and very delicious and welcome it was too! After eating our scroggin on the embankment for the old One Tree Bridge, we headed off again on the other side of the river; initially under some wonderful Karri trees beside the river then onto an extended rail formation, which didn't really produce the promised 'wonderful' views of the river. Being so close to the river, and deep in the river valley, the track environment was very moist which was not only evident in the thick under-story but also in the amount of moss and fungi on the stumps and logs. The river was big and flowing and attractive, and in the course of the day it came and went, sometimes there deep and silent, other times proclaiming its presence with noisy shouts over rapids and loud gurgling and splashing. Our lunch stop was such a place. I was so hanging out to stop and P had agreed we find a place and I was just about to settle for a mossy log on the side of the track when P heard a loudish noise and we realised it was the river and that spurred me on and boy was it worth it. Our God provided this spectacular part of the river with a camping / picnic area right next to it with great rocks, logs and flat areas with grass for sitting or reclining. Just fabulous. The river certainly was close all day -- not that you could see it often. Sandi and I had just remarked that it was very quiet at the moment when we came around a corner to hear a thunderous roar -- which turned out to be a great spot for lunch. Heading off again we had many rivers to cross (and songs to sing) on our way to camp, walking through the Chappel's Bridge campsite that had a very welcome pit toilet. A lot of walking along old railway formations today, with lots of cuttings and embankments. It was a pity some of the old railway bridges couldn't have been restored, they would have made excellent creek crossings above the undergrowth. Camp picnic area at Chappel's Bridge was good -- a log shelter, a long drop toilet. Very new and clean (and welcome) and several wood fire BBQs. Last haul to here seemed very hard, loved the one-tree bridge the army have built over the river, really great and then we're here! Have rinsed socks and knickers in river. Lots of mozzies and sand flies in all these river spots. Last thing: the undergrowth along the river a bit the same but lots of wee orchids, which are so great! Also budding up are these fabulous blue lilies, they'll be marvellous next week lining the paths. Saw a good number yesterday too! Well, have arrived here and I do feel fatigued, and my knees are feeling sore so very glad to arrive. The photo of Boarding House shelter on p69 of the book is taken from a wee track down to the river where we wash our clothes. 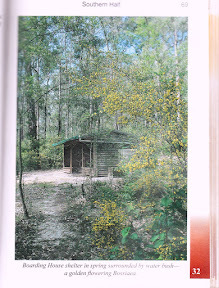 The surrounding bush has grown significantly since the photo was originally taken! It was a lovely bushwalk today -- not many highlights, but lots of great forest. Walking in the Karri forest is absolutely amazing, although there would be a big difference when the water and soap bush are young or mature. When mature you can't see anything at eye level, but these graceful, tall trees rise out of the undergrowth above you. Interesting at the moment no mobile phone cover for a few days now, I think the last was at Blackwood campsite. Popped the tent inside the shelter again as it still looks like a chance of rain. Bummer about the cafe -- and woefully out of date books!! As I write @5:30pm there are small patches of blue sky floating past, North to South I think. I hope it continues to break up and we get some sun tomorrow. The FUSE has done an amazing job in the last bit with mostly overcast and rain to get to 2 lights: but it would be good to get some real charging. The book says tomorrow is a challenge, which it seems to be judging by the height profile -- I hope it indicates a nice variety of landscapes.